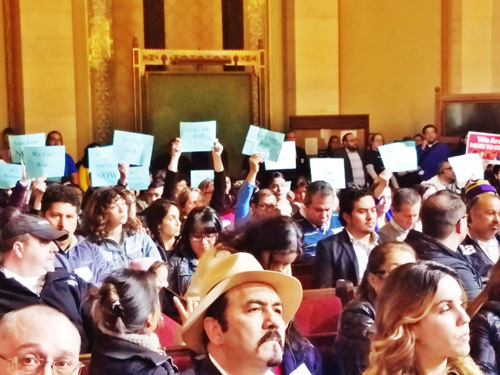 The Los Angeles City Council continues to prepare for a likely battle with President Donald Trump over his aggressive executive orders on immigration. The council voted late last week to direct the city attorney to report on how it can protect immigrants from expanded federal efforts at deportation, while Councilman Gil Cedillo introduced a motion supporting state Senate Bill 54, known as the California Values Act, which would ensure that state and local resources are not used to fuel mass deportations. Trump recently issued a number of executive orders that would add thousands of Border Patrol Agents and immigration officers, build a wall on the Mexican border and cut funding for so-called sanctuary cities that refuse to cooperate with federal immigration authorities. Trump has threatened to deport up to 3 million immigrants who are in the country illegally, and an estimated 850,000 of Los Angeles’ 3.8 million residents are not currently citizens. “Beginning today, the United States of America gets back control of its borders,” Trump said Jan. 25 during a speech to employees of the Department of Homeland Security. Over 350 people packed the Jan. 25 meeting, held just hours after President Donald Trump announced plans to deport millions of immigrants in the country without legal status. Photo by Fredy Ceja/Office Councilman Gil Cedillo. The motion, which was approved 10-0, was forwarded to the full council by its Ad Hoc Committee on Immigration, attended by a packed house of more than 350 people during its inaugural meeting on Jan. 25. About two dozen took their turns speaking to the committee against Trump’s actions announced just hours earlier. “Our friends in immigrant detention can’t be with us tonight but I’d like to think that they would ask you to respond forcefully and bravely to the xenophobic and racist executive orders that were issued today,” said Jordan Cunnings, a lawyer with Public Counsel who works with immigrants in detention centers. The executive orders added a significant layer of urgency to the work of the committee, which was created by the council in the days after Trump’s election win in November and is one of a number of moves it has made in opposing the president’s immigration policies. “What we see today with the executive orders is an attempt to legislate and create laws based on a person’s class, ethnicity or religion, and that’s a dangerous path, something of which we haven’t seen since World War II when we interned a number of Japanese Americans, and we are now on that path,” Councilman Jose Huizar said during the committee’s meeting. Trump’s orders could also have significant ramifications for Los Angeles, which receives roughly $500 million in federal support annually. While not fitting the typical definition of a “sanctuary city,” Los Angeles has a policy of separating the work of the Los Angeles Police Department from that of federal immigration officials, and it is not clear if that would put it in danger of losing its federal funding. Trump’s orders declare that “sanctuary jurisdictions” would be determined by the secretary of the Department of Homeland Security. Even as the meeting was ongoing, more news trickled in. Councilwoman Nury Martinez announced she received a news alert on her phone that said Trump will publish a weekly list of crimes committed by immigrants in the country without legal permission as a way to pressure sanctuary cities. “If that is not a declaration of war and intimidation, I don’t know what is,” Martinez said. Representatives from the Los Angeles Police Department, Los Angeles Unified School District and the Los Angeles Community College District Board of Trustees also addressed the committee. LAPD Deputy Chief Robert Arcos gave the council a report on the department’s Special Order 40, a policy dating to 1979 that states officers will not detain a person for the sole purpose of determining their immigration status. The immigration committee passed a motion voicing support for Special Order 40, which outlines the Los Angeles Police Department’s decades-old policy of officers not instigating police activity for the sole purpose of determining an individual’s immigration status. The committee also approved a declaration of opposition to any federal policy that would reverse immigration relief created under President Barack Obama’s administration and a request for a report from the city attorney on the legal efforts the city can take to protect the immigrant community from expanded deportations. The council and Mayor Eric Garcetti have also committed $2 million to a $10 million legal defense fund for immigrants facing deportation. “With the County of Los Angeles home to 1 million of the estimated 11million undocumented immigrants living in the United States, and the majority of those immigrants intertwined in all levels of life here in Los Angeles — including social, civic and economic — the deportation of any sizable percentage of that community would have a devastating impact on those immigrants, their children, as well as potentially, the city’s economy,” the motion states. The Los Angeles County Board of Supervisors voted Tuesday to contribute $1 million, growing to $2 million next year, to a legal aid fund for immigrants facing deportation proceedings. County officials and Los Angeles Mayor Eric Garcetti announced the creation of the $10 million L.A. Justice Fund on Monday, calling it a direct response to Donald Trump’s threat to increase deportations of undocumented immigrants and other “dangerous rhetoric” by the president-elect. Supervisors Hilda Solis and Janice Hahn recommended the county’s participation. “We have a history of providing help to all residents,” Solis said, noting that the county’s social services safety net provides lunches for seniors and children and emergency medical care for uninsured residents, documented or not. The fund is a partnership between the city and county of Los Angeles, California Community Foundation, Weingart Foundation and the California Endowment. Garcetti said the city will contribute $2 million from its general fund. The county’s $3 million, to be contributed through June 30, 2018, is subject to matching contributions and private philanthropic organizations are expected to chip in $5 million. Those with legal representation are three to five times more likely to win the right to stay in the country, according to Feuer. Without legal help, “happenstance, the luck of the draw, will determine who remains in this country and who doesn’t,” the city attorney said. Los Angeles United School District board President Steve Zimmer offered his support. “Children are coming up to us, parents are coming up to us, with real and sincere fear about what will happen to them – but not just to them, to their dreams, to their hopes, to their aspirations,” he said. The majority of speakers urged the board to approve the funding, but a vocal crowd of opponents argued that using taxpayer money to help individuals who came to America illegally amounted to taking money away from legal residents in need. “Not everyone’s OK with this. People are OK with legal immigration,’’ said Emily Hemingway, who identified herself as a Republican living in Los Angeles County. She told the board that “people cutting in line’’ and “leeching off of our system’’ is unfair and threatens the integrity of the social safety net and public education. Supervisor Sheila Kuehl told opponents that the county spends many millions for public defenders to act on behalf of residents accused of crimes. Barger added that she thought it wasn’t fiscally responsible for the board to step up and contribute when nonprofit groups were willing to help. Solis made a different economic argument, telling her colleagues that immigrants, both documented and undocumented, are a vital part of the local workforce. “The contribution that undocumented immigrants make to the county is roughly $57 billion,” Solis said, referring to a local GDP estimate. Others shared a personal perspective. The L.A. Justice Fund is expected to focus on helping immigrants in the county under temporary status such as the Deferred Access for Childhood Arrivals program, military families, refugees and unaccompanied minors, but not immigrants with a serious criminal history. Solis said it costs roughly $5,000 to fund one deportation case. Experts estimate that about 7,000 Los Angeles County residents face removal proceedings without a lawyer annually, according to Solis’ office. Some questioned whether the fund would be constitutional. Feuer and at least one other legal expert assured the board it would be consistent with federal immigration law and principles of fairness and due process.